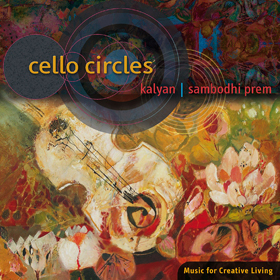 Cello Circles has been a collaboration with my musician friend Sambodhi Prem in New Zealand. We had a wonderful journey together, with musical closeness and creative richness. The melodies of my cello, flutes and dilruba merge with Sambodhi’s guitar and the textures of his keyboard. Listening to Cello Circles, I feel my inner core of creativity stimulated. Relaxed acoustic music – fluid cello melodies interwoven with guitar, keyboard and flutes. Instrumental album with 8 songs. You will find more information on the making of Cello Circles on www.globalsuitcase.com. ‘Cello Circles’ is a breath of fresh air. Now and again we find an example of musicians coming together for no other reason than to play for the sheer pleasure of making music. These two musicians, Sambodhi Prem and Kalyan, are such people. Tthey are not screaming for your attention., nor have they created this music seeking recognition. They simply share their experience of the friendliness they feel for each other, through their instruments. Simple, yet complex, eloquent music. ‘Cello Circles’: la tranquillité des grands arbres; la délicatesse des fleurs. J’adore!